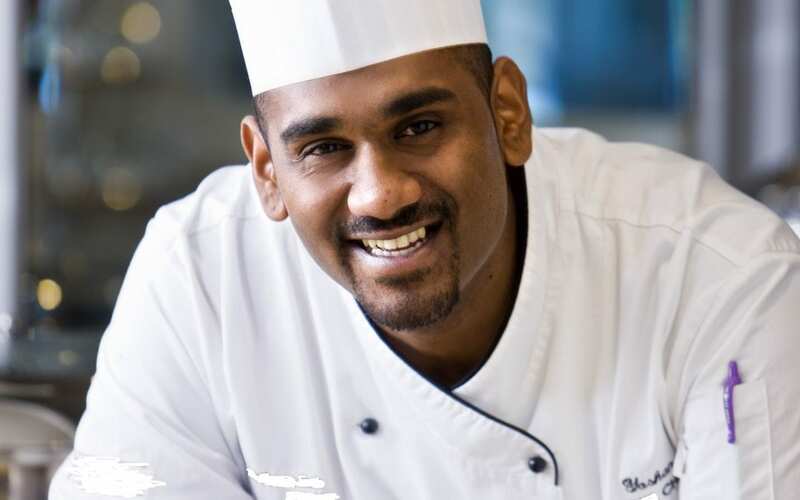 Yoshan Naidu, recently appointed in the coveted Executive Chef position at Tsogo Sun’s award-winning InterContinental Johannesburg O.R Tambo Airport, is looking forward to the opportunities, challenges and highlights that this new position has to offer. Yoshan is no stranger to Tsogo Sun having spent two years as the Executive Chef at Southern Sun Pretoria, and earlier honed his art at the Southern Sun Elangeni & Maharani hotel in Durban, KwaZulu Natal. A ‘home-grown’ talent, Yoshan grew up in Chatsworth, Durban and started experimenting and getting acquainted with different favours at an early age. “From the age of ten, while the other kids were out playing cricket or soccer, I would be experimenting in the kitchen. Often, I would get home from school and decide that I wasn’t in the mood for my mum’s chicken curry or egg and tomato chutney. I would dig up something from the freezer and then cook whatever caught my fancy”, says Yoshan. After finishing formal schooling, Yoshan was at a loss as to which career to follow and decided to join his brother in Johannesburg. He enrolled at the Boston City Campus where he received a catering and hospitality qualification. Yoshan started his in-service training with the Orion Group in the KZN midlands, and then moved on to a casual position at the Hilton Hotel in Durban. Determined to follow his dream to cook and inspire people with food, he soon secured a position at Sibaya Hotel and Casino and was promptly promoted to the hotel’s banqueting division, catering to events, weddings and gala dinners. Consistently hungry for new challenges, Yoshan became head of room service at Southern Sun Elangeni in 2006. One of the highlights of his career was when he was offered the position as Executive Sous Chef for the Maharani Tower where he played a lead role in reviving and revitalising the kitchen and the hotel’s menu. As a young, talented chef in the Tsogo Sun stable, Yoshan has participated in several competitions and food expos. In 2012 he participated in Tsogo Sun Chef of Distinction and he was part of the winning team at Unilever’s Team Chef of the Year. Yoshan is also the winning contestant of Chopped South Africa 2014 and has been featured in Erica Platter’s, East Coast Tables Durban Curry cookbook and Get-It Magazine’s feature on Banting-friendly restaurants in Durban. “Cooking is not just my work, it’s my passion! I believe that food should be simple and tasty. Drawing on rich, diverse South African food traditions my cooking is classic fusion. I love cooking with fresh, seasonal ingredients and strongly believe that a fresh sprig of coriander or a freshly picked peppadew can make a dish come alive. I am looking forward to enhancing the already phenomenal offering of the InterContinental Johannesburg O.R. Tambo Airport hotel, and bring South Africa’s best flavours to international and local guests alike,” concludes Yoshan.